Royal Kaiser, the king of the jungle, comes to League of Angels II to assist warriors in battle. It is hard to tame such a fierce animal, but brave warriors has never ceseased to tame it. Now it will show up in upcoming Angel's Fortune from Jan. 23rd to Jan. 25th. Let's take a closer look at this mount. 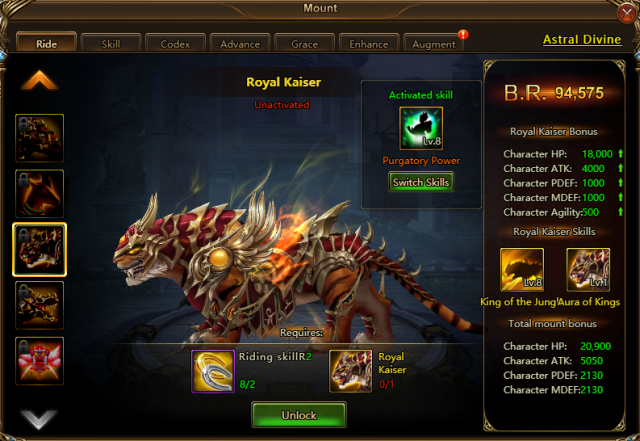 Royal Kaiser is an Artifact Grade mount. His Grace skill Aura of Kings can help gain Rage, and restore HP and ATK which will greatly boost the squad Battle Rating. Increase the ATK, AGI, and Hit of the entire squad by 19.4% for 5 turns. ③. Each time an ally uses an Ultimate skill, increase ATK by 5.2% until the end of the battle (can stack up to 5 times). Participate in the upcoming Angel's Fortune event from Jan. 23rd to Jan. 25th and you'll get the chance to ride powerful new mount Royal Kaiser! Stay tuned for more great content coming to League of Angels II. Last：Lucky the Pig Gives Lucky Blessings!